Relationships are wonderful, rewarding, beautiful, exhilarating, frustrating, tough and everything in between. They can bring out the best and the worst in us. They change over time, for better or for worse. But when faced with difficulty, how do we know when to try harder, and when to part ways? I have asked myself this question numerous times over the years and it has never been clear cut. As some can attest, I am by no means a relationship expert, but I do know what hasn’t worked. I know that successful relationships of any sort – be those among friends, family or lovers - take work, compromise, acceptance, and patience (and many other things). In their absence, a relationship can go off the rails...and stay there. Having said that, those essentials are NOT everything. In fact, too much of a good thing is possible and detrimental. Any one of those fundamentals can become “too much” in the absence of reciprocity. If one person has “checked out” for whatever reason, the relationship cannot be sustained. Can a relationship endure one-sided trust? One-sided love? 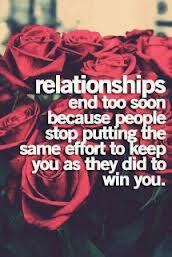 One-sided effort, acceptance, loyalty etc.? I would argue that above all else, reciprocity is key. The absence of reciprocity creates imbalance. It implies that one person will ultimately compromise themselves and their needs in the interest of the other, given enough time. That’s when you must go your own way knowing you've done everything you could. However, a shared commitment to genuine effort, mutual feelings of love, open communication, and continued trust, respect and patience, will arm you with (many of) the essentials required to ride the natural ups and downs together. But a chance at "success" is dependant on a commitment from both parties to trying to make it work.